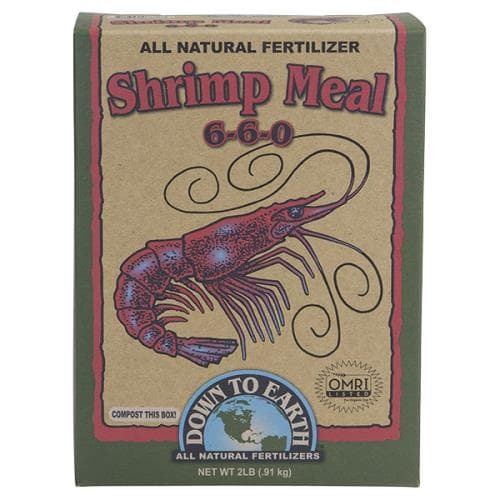 Down To Earth™ Shrimp Meal 6-6-0 is an excellent all-purpose fertilizer rich in nitrogen, phosphorus and calcium. It is wonderful for use on all types of garden vegetables, flowers and herbs. A valuable byproduct of the fresh Pacific shrimp processing industry, finely ground DTE™ Shrimp Meal 6-6-0 will break down rapidly in the soil to promote vigorous plant growth and development. An excellent all purpose organic fertilizer derived from ground Pacific Northwest shrimp shells. Rich in Nitrogen, Phosphorus and Calcium, Shrimp Meal is wonderful for all types of garden vegetables, flowers, herbs and ornamentals, and also acts as an exceptional compost bio-activator. Shrimp Meal is rich in Chitin, a natural polysaccharide that can help plants develop healthy immune responses and stimulates the growth of beneficial soil micro-organisms.